Hidden in the city center, surrounded with history and full of passion the Secret Garden Hostel. It is believed that it possesses magic powers. Anyone who would find it and enter the tiny garden full of Mediterranean plants, would be freed of all worries and become happy and energized. Young and dynamic atmosphere will be glad to host you in 4 comfortable and recently renovated rooms. Located only 700 meters away from beach and 1.4 kilometer away from main bus/train station. Literally everything is reachable by foot.We are located in old city center, full of history. There are many restaurants , bars , fast food in a range of few 100 meters. And of course variety of shops. At our property we offer 4 rooms (total 20 bunk bed type).There is two shared kitchens and two shared bathrooms at property.Free wifi and towels. Flat tv screen. Honest 5 / 5 for each aspect! Super cool stuff, super clean everything, awesome location, great price. As I came for work, I especially liked that there were power sockets next to each bed and the WIFI fast. Would be nice to have all hostels be so prepared. All great, really, would definitely come again. This hostel is worth every Euro you pay for it. Been to quite a few hostels before and this one is the only one I reviewed with 10. I recomend it to everyone. Pretty standard hostel for the small town, everything was smooth, nothing to complain about. Good location and clean especially for showers. 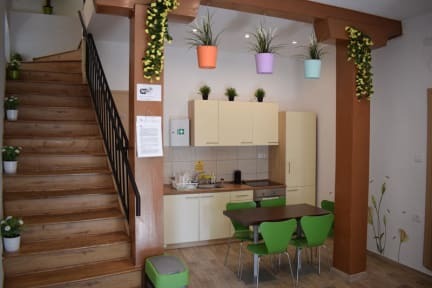 Overall, I liked the hostel, it's well located, but it doesn't have a common area, except the kitchen and it has just two bathrooms. The beds and pillows were good, I was staying jn the room that has a balcony overlooking the secret garden, so that was nice. The hostel is in a great location. It has comfortable, clean beds, security lockers, plug sockets by each bed and good kitchen facilities. However, the showers ran cold after a few minutes and our room had no heater, so it was freezing. There's only one bathroom per floor, so there was always a queue. There is rarely anyone at reception- I had to call the hostel and wait 10 mins for someone to let me in on arrival, though he did allow me to leave my luggage after check out. Located in a cute neighbourhood. Walking distance to the waterfront and bus/ train station. I think that having only one bathroom for that amount of guests was a bit ludicrous. There was constantly a line up to use the facilities. The room was tidy but I did see some dust bunnies, nothing major. The bathroom could be cleaner - if there was a free moment with all the constant traffic to clean it. The reception guy was abrupt and a little off putting when I checked in. I didn’t get a tour. 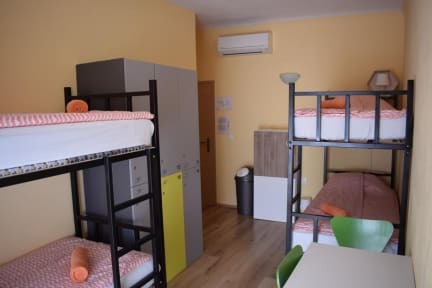 This is a basic hostel. When you check in, you'll have to call the guy to come let you in. He will give you your key and room number and that's all. You'll never see him again. There are maps on the desk if you want one. The hostel is alright. In a newer house and clean. I noticed the bin in the kitchen was never changed during my 3 days here. Location is good. It's nice and quiet, just strange that there's never anyone at reception. This was okay - all was provided for, although there were only two bathrooms on 4 bedrooms. However, I didn't like the atmosphere there at all, and the person manning the reception desk didn't seem to be there most of the time.